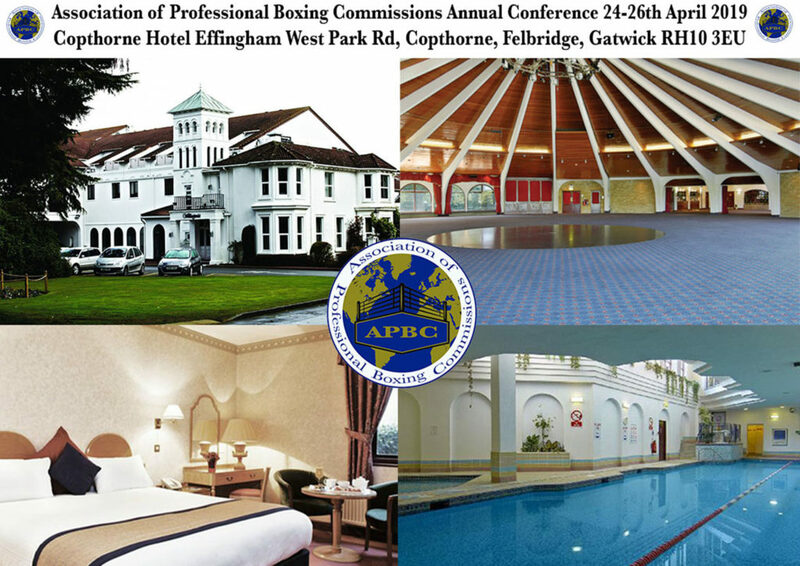 The 2019 Association of Professional Boxing Commissions (APBC) Annual Conference will take place between Wednesday 24th April 2019 and Friday 26th April 2019, at the Copthorne Hotel, Effingham West Park Road, Copthorne, Felbridge, Gatwick RH10 3EU in the United Kingdom. To make room reservations for the duration of the conference please go to https://www.millenniumhotels.com/en/gatwick/copthorne-hotel-effingham-gatwick/offers/ and add discount code BIBA2019 in the group code box. The full agenda of the Conference will be published shortly and besides discussions and presentations includes numerous accredited courses, such as Referee/Judge, Inspector, Time Keeper, Head Trauma Signs and Symptoms Awareness, First Aid etc. there will be an exposition and presentations of Boxing Related products and services. The whole event culminates in an evening of Professional Boxing on Friday 26th April.